I had Dish Network nearly 15 years ago and they were very bad then. I remember them making promises to me that they had no intention of following through on. I eventually ditched them and went with DirecTV until I moved to Alaska. I then wanted to sign up for satellite television when the local cable company dumped a couple channels I watched regularly. I tried to get DirecTV again, but where I lived in Alaska, I had no line of sight for DirecTV, but I did for Dish. So I called and joined Dish. The sold me on two receivers, the main being a VIP 612 DVR. I asked questions when I got the receiver. I asked about 1080P, 3D, Audio, everything and the Dish representative told me that the VIP 612 was fully upgradable, and that I would have software downloads to turn on 1080P, 3D and any audio upgrades as they happened. There was a higher level receiver, a 900 series, that was out of stock when I ordered, but I was promised that my receiver would be upgraded through software downloads. That has NEVER happened. I passed out cards for people to sign up for Dish Network that the company sent to me, and I know that I had at least 5 people sign up for Dish using the referral cards that I had handed out, but Dish states that they do not have any record of them. Figures. I was supposed to get money off my bill and a free iPad for the referrals, but that never happened. What a joke. Then I had to move to Colorado, and I called to use the Dish mover program. Dish mover was supposed to give me a free upgrade, including the new Hopper/Joey setup (these receivers came out soon after I got my VIP612 and was why my systems never upgraded because they were now obsolete), and a free sports pack upgrade or some other package. I was told I did not qualify for Dish Mover. It was three months before I got into my condo in Colorado, and I called Dish and said that I needed to suspend my account until I got moved in. No go. I could cancel, and pay a early disconnect fee, so I paid for three months service I could not use. Then the blackouts. A month in 2014 without Turner broadcasting networks because Dish was trying to protect my over $110 a month bill (and I have no HBO/Showtime packages). I was pissed. But then, when the last blackout occurred that took NBC away for a time, I was fed up. I called and talked to Dish Network and they offered to fix everything. For a price. My referrals that were never credited would not be credited. But, they were more than willing to give me a new Hopper and Joey receiver for more money each month. And then as a sorry for the latest blackout, $5 off a month for three months. WOW! What a crappy deal. Then I was offered $10 off for three months, then I was told that I would receive a discount to take my bill to $80 a month. I agreed to that, and guess what. My bill has never been adjusted. Dish scammed me. Told me that my equipment was upgradable, but in fact it was obsolete and the only way to get what I was promised was to spend more money. 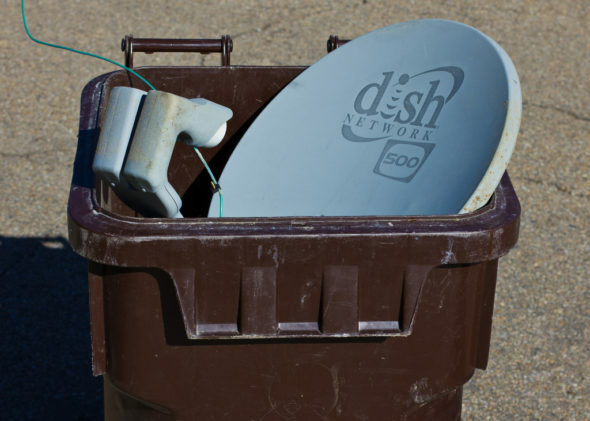 Dish would not give me the Dish Mover program, but I could spend more money to get the same stuff Dish Mover was supposed to give me for free. Dish would not suspend my account for three months and I paid for service I could not use for three months. Dish stated I never had any referrals, even though I did, and I never got the money discounted from my bill or a free iPad like Dish promised. Dish offered me a $80 a month bill as repayment for loss of channels, and to keep me as a customer, which they have not adjusted my bill to after two months that that promise was made. Either update my software on my receivers as promised or upgrade my receivers to do what I was promised at no extra charge to me. Credit my bill for the three months service I paid when I asked for Dish Mover and to hold my account until I was moved in. Give me the sports package that I should have gotten as part of the Dish Mover program. Give me the credit for the 5 accounts I know I had referral sign ups for in Alaska, and either the iPad I should have received or the current offer of an Xbox One system. Drop my bill to the $80 promised me. If all of these are not taken care of within the next 10 days, I will contact the Better Business Bureau, Reseller Ratings, and the Attorney General of Colorado. I will also make sure that everyone knows how Dish treats customers. Really treats customers. Ok Dish, the ball is in your court. This entry was posted on Saturday, December 12th, 2015 at 3:22 am	and is filed under News, Reviews, and Tips and tagged with dish. You can follow any responses to this entry through the RSS 2.0 feed.